Heat oven to 375°F. Place bread slices in ungreased 15x10x1-inch pan. Bake 5 to 7 minutes or until crisp; cool. In small bowl, mix lettuce and dressing. Top each bread slice with lettuce mixture. Layer cheese, salami and tomatoes on bread. Sprinkle with garlic-pepper blend and basil. Lightly drizzle olive oil over the toasted bread instead of using Caesar dressing. 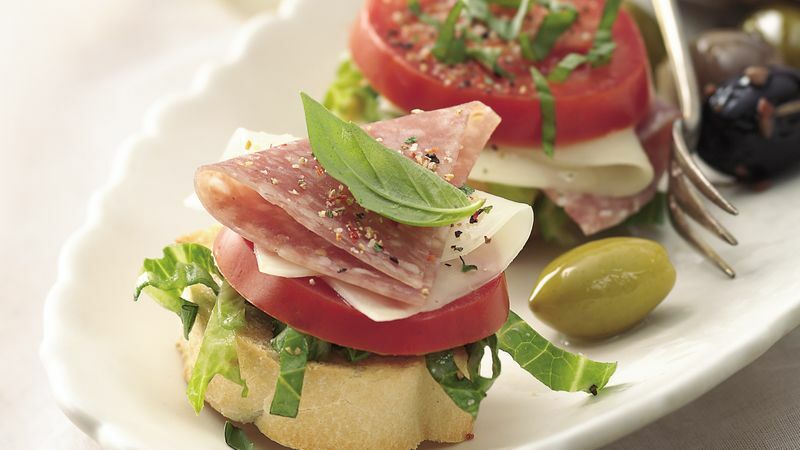 Tuck fresh sprigs of oregano and basil among the salami stacks, and garnish with cherry tomatoes and olives.